Dr. Shirani Bandaranayake was sworn in as the new Chief Justice of Sri Lanka on 18 May 2011. While some remained silent most local media outlets published news items and features supporting her appointment. Certainly none were willing to do their jobs as journalists. I phoned a couple of editors and inquired of them, “are you forgetting the past? Why do you ignore the blatant conflict of interest issue here because of her husband’s position in a government job. Why do you not focus on the wider issues of rule of law and independence of the judiciary? It was easy for the local media to gloss over the real issues as Shirani Bandaranayake would, on May 8, become the first woman Chief Justice of Sri Lanka. And it was convenient for the media to focus on this positive aspect rather than grapple with the more uncomfortable and more dangerous issue of a country descending into democratic failure. Of course, she is the first female Chief Justice in Sri Lanka. But her upward trajectory to this place in history was alarmingly and unnaturally swift. Shirani Bandaranayake moved through the judicial system faster than anyone else and her career from the position of a Supreme Court judge to finally the Chief Justice of Sri Lanka last month to which high position she was appointed by President Rajapakse is not without controversy. She was never a Judge at any level of the court system in Sri Lanka, she had gone into academia and had never practiced as a lawyer either until she was controversially appointed to the Supreme Court by then President Chandrika Bandaranaike in October 1996. There were fierce protests at that time from lawyers and judges alike but it was a time when the Sri Lankan democratic landscape though faltering was not as debilitated as it is today and limited though it was their was still room for dissent. It was interpreted as a political appointment in order to keep the judiciary on a leash. Chandrika’s advisors who supported devolution interpreted it as the “need for pro devolution judges on the bench”. This was a time the government had put forward a power sharing devolution package as part of a political settlement with the Tamil Tigers. But it was clearly a political appointment and a part of the systematic politicisation of the judiciary. Her appointment was even legally challenged by a group of lawyers but the Supreme Court was to dismiss the case. While Shirani Bandarayake sat on the bench of Sri Lanka’s apex court, her husband Pradeep Kariyawasam was a man working in the marketing field. In June 2009 following a Supreme Court order to the Treasury Secretary to appoint a board of directors to the Sri Lanka Insurance Corporation(SLIC) after the government took it over, President Rajapakse who is also the Minister of the Finance, was to appoint to this new SLIC Board none other than Shirani Bandaranayake’s husband Pradeep Kariyawasam. Not only that he also made Kariyawasam the chairman. And here in lies the rub. The names proposed by President Rajapakse for the new board of directors for the Sri Lanka Insurance Corporation was to receive Supreme Court approval after the list was presented to court by Deputy Solicitor General Sanjaya Rajaratnam on 26 June 2009 on behalf of the Treasury Secretary. But Kariyawasam’s good fortune didn’t end there. He was again appointed to the Lanka Hospitals Corporation PLC as a member of its Board of Directors along with Defence Secretary and Presidential sibling Gotabhaya Rajapakse who was Board Chairman. It is not a secret that Sri Lankan government institutions have been spending millions of rupees to ruling party election campaigns and government propaganda projects. The Sri Lankan government officials are quick to boast that Sri Lanka has “one of the best judiciaries in the world” because so few judges have ever been found guilty of corruption. When Sri Lanka’s Permanent Representative to the UN in New York Palitha Kohona was interviewed by channel 4 in UK about war crimes he said; “ the government has just appointed a Commission of Inquiry to go in to this type of allegation, ……… Sri Lanka has a history of a very highly respected judicial system. To suggest anybody from outside can do a better job is simply ……. colonialist”. This boast does not stand up to scrutiny if one analyses the pathetically feeble investigative history of the Sri Lankan Judiciary. He then pointed to his wedding photo hanging on the wall and said “ look at this. This is Sarath’s son”. Sarath Silva’s son was the pageboy at Mahinda Rajapakse’s wedding. Ironically Chandrika Kumaratunge’s own political appointee was to turn against her in favour of her would be heir. 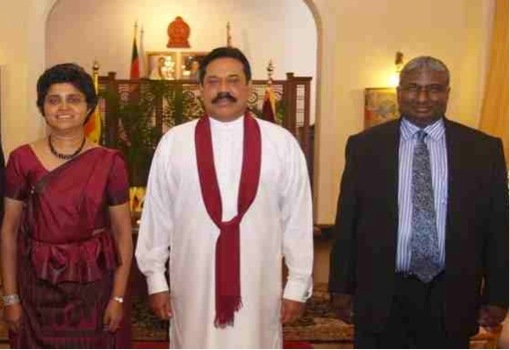 By Friday, 26 August 2005, Chief Justice Sarath Silva ruled that President Kumaratunga must step down from the presidency by December, even though she argued she had another year in her term. In 2005 a series of in depth investigative articles by Sonali Samarasinghe on the Helping Hambantota scandal where Tsunami funds received by President Rajapakse were being siphoned off into a private bank account controlled by him was published in the Sunday Leader newspaper of which Lasantha Wickrematunge was editor in chief. Based on these articles the opposition UNP made a complaint to the Police and to the Bribery Commission and Rajapakse was to be arrested. Before any action could be taken on the complaint, Prime Minister and Presidential candidate, Mahinda Rajapakse quickly filed a fundamental rights application. Sarath Silva not surprisingly gave a decision in favour of Rajapakse and also stated in his judgement that he cannot act on the basis of newspaper reports. However after he retired from the bench Chief Justice post Sarath Silva confessed at a seminar in March 2010 titled “Law, Democracy and the Country’s future” at the Jayawardena Centre, that “Rajapakse filed a fundamental rights application and…..I took the stand not whether the complaint was true or false… but that it was politically motivated. If we had not taken such a decision …..If the President had been remanded on the Tsunami fraud allegations, he would never have been able to contest elections”,Silva added. It is important to note that following the investigations by journalist Sonali Samarasinghe the President was compelled to even return some of the moneys from his private account back to the donors. Therefore it was not a question of whether the allegations were a true or false but that there was in fact political motivation. The motivation however came from the Supreme Court Bench rather than from the journalist. Like all chief justices since President J.R. Jayawardene’s 1978 Constitution, Shirani Bandaranayake’s too was a direct appointment by the President. That then is not the point. What however is, is that none of the other spouses of previous judges have accepted political appointments themselves. The Chief Justice is automatically the Chairperson of the Sri Lankan Judicial Services Commission. This means that, effectively, she is the boss. While much of the work is delegated to others, it is the Chairperson who is ultimately responsible for the “corporate culture” in the operations of any organization. This is how organizations operate on a psychological level. The leader sets the tone. The relationship between the Chief Justice of Sri Lanka and her spouse cannot be private. But when that spouse holds key positions in government institutions that is conflict of interest.